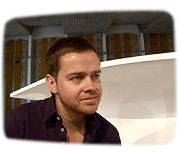 Mark Holmes is the design director at Established & Sons and designs for both Established & Sons and other acclaimed international manufacturers. After studying painting he began a career as an independent artist. In 1997 he opened his first London showroom, in 2003 he founded “The Lane” (together with Sebastian Wrong, who is also operations director at Established & Sons). For Established & Sons he designed the Pinch chair and the Track storage system (new collection 2006). Design Miami/ Basel, June 15, 2006.